Angiotensinogen, the precursor of all angiotensin peptides, is synthesized by the liver. In the circulation it is cleaved by renin, an acid protease, which is secreted into the lumen of renal afferent arterioles by juxtaglomerular cells. Renin is synthesized as a large preprohormone called as preprorenin. It is then cleaved to prorenin and eventually to renin. Prorenin is also secreted by other organs like ovaries. But, conversion to renin is almost exclusively the job of the kidney. This has been seen after nephrectomies. The level of prorenin in the blood remains more or less the same while that of active renin falls to almost zero. Renin cleaves angiotensinogen, thereby forming angiotensin I. 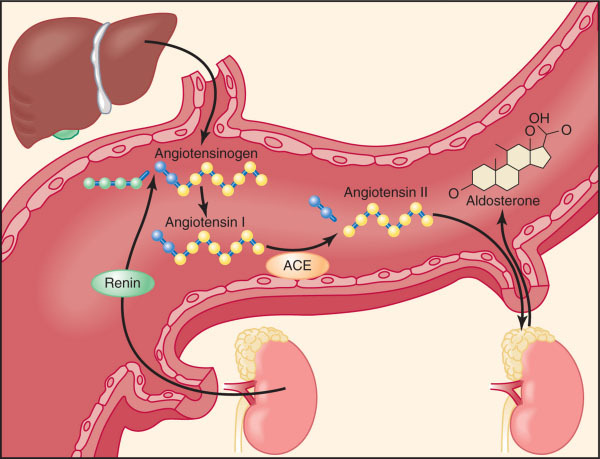 In turn, angiotensin I is cleaved by angiotensin-converting enzyme (ACE), an enzyme bound to the membrane of endothelial cells, to form angiotensin II. Much of the conversion occurs as blood passes through the lungs but it also occurs elsewhere in the other parts of the body too. In the zona glomerulosa of the adrenal cortex, angiotensin II stimulates the production of aldosterone. Angiotensin II is itself a potent vasoconstrictor. Constriction of the arterioles leads to an increase in both systolic and diastolic blood pressure.